It was to be a meeting of two titans of the dance world: Israel Galván, a flamenco dancer known for pushing the boundaries of that traditional form of dance, and Akram Khan, one of Britain’s top choreographers who has garnered worldwide acclaim for his unique contemporary dance inspired by an ancient Indian style called kathak. The pair were to bring their two unique styles of dance together in a show called Torobaka. Unfortunately, Galván recently suffered a knee injury while performing in Paris and is unable to perform. Previous engagements of Torobaka had to be cancelled but in the interim Khan has been busy adapting the show into a new solo piece simply titled TORO to be performed for this Toronto engagement. It’s thought that kathak is an antecedent of flamenco, as the dance form migrated from India to Europe via the Middle East with the nomadic Romani people. The two forms share some similarities including percussive footwork and circling movements, so a show combining and exploring the two styles would seem like a natural fit. My disappointment at missing out on the chance to see Galván perform was tempered by curiosity, anticipation, and even a little excitement at witnessing Khan, a renowned dancer/choreographer, thinking on his feet to create a new solo work based on the original. Sure enough, Khan, who previously wowed Toronto audiences with DESH in 2013, is a master and he is thrilling to watch. Khan’s choreography is fast-paced, athletic, at times almost animalistic when he seems to channel the bull of the title at other times graceful as his arms move in fluid arcs in contrast to his fast footwork. However, I felt that the structure of the piece may have been affected by the adaptation to the point where the components of the show feel a bit disparate and the overall concept doesn’t come across as clearly as it may have in the original. TORO is not a narrative piece like DESH, and the revised structure meant that I sometimes found the shifts in tone throughout the piece a bit disorienting. There are moments of whimsy like when Khan performs on all fours with a pair of flamenco shoes on his hands periodically using his own cranium for percussion, but then the tone changes without much flow in the transitions. I really enjoyed the music in the show. Performed live by a quartet, the score mirrors the choreographers’ styles by being rooted in tradition but sounding distinctly contemporary. I thought the idea to pair a countertenor (David Azura) with a contralto (Christine Leboutte) was an interesting one, perhaps meant to further subvert traditional notions. In the revised version of the show, the quartet of musicians plays a more prominent role in the staging. While I thought the comedic vignettes, where Indian percussionist B.C. Manjunath engages in musical dialogue with the other musicians in a series staggeringly rapid-fire vocalizations, injected some welcome levity to the show, at other times the musicians seemed to tentatively execute their blocking while Khan literally danced around them. Ultimately, it felt to me as though the show, which was originally structured as a dialogue between two dancers, now feels as though half of that dialogue is missing. At times one of the musicians, Bobote, a talented palmero also skilled at performing percussive flamenco rhythms with his feet, moves in opposition to Khan, giving a tantalizing hint of what the original choreography with Galván may have looked like. Certainly, Galván’s influence is there in the music and some of the movement design however I still felt his absence and as a result the piece felt a bit unbalanced. TORO is not an unenjoyable evening of dance by any means, seeing Khan perform is worth the price of the ticket and I certainly commend him for creating something original on the fly given the circumstances. It’s also understandable why the piece still feels a bit like a workshop given the short amount of time Khan had to adapt and rehearse this new show. Still, I’m left wishing I was able to see the piece as originally conceived. Best wishes to Israel Galván for a speedy recovery. Shows run March 9, 10, and 12 at 8 p.m., March 11 at 7 p.m.
Tickets are available available online, by phone at 416-368-3110 or in person at the Berkeley Street Theatre box office. 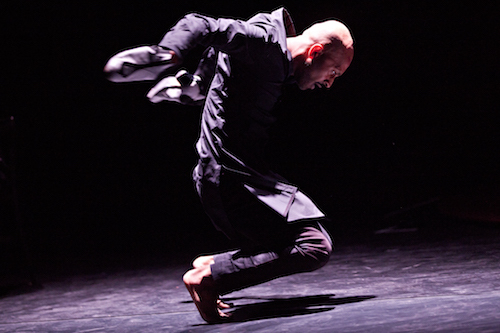 Photo of Akram Khan by Jean-Louis Fernandez.